Len Bowen, Chisholm, ACT, Australia "Still on the RAAF Reserve. Will have my Air Movements arm band on when I meet & greet our overseas guests at Melbourne Airport (Tullamarine) for the Avalon Air Show in March this year." This photo is a little bit before my time but I think I can pick out a few movers: Sam Savoie, Red Fielding (with black rimmed glasses), Brian Shearon and WO Bob Lyons. I think the picture was taken in one of the classrooms at the old 426 Sqn building by the red checkered water tower in Trenton. Lots of Molson Export on Hand! Good effort Steve... just missed out on that prize again! I believe the photo of the Canadians and Brits in the top photo is from a Cross Check Exercise from back around 1975. The Canadians are: Back Row Sgt. Clarance Gaudet, Sgt Paul Deschene ( I think?) Sgt. Red Feilding, Mcpl (? Senior Moment! 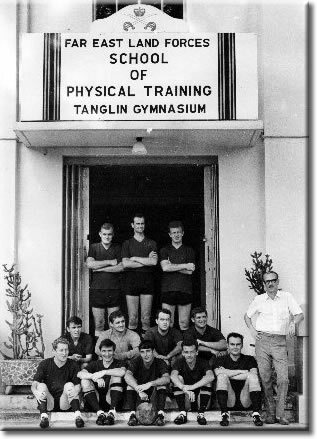 ), Mcpl Harry Freisen, Mcpl Brian Sherron, MWO Bill Clarke and in the front row WO Bob Therrian. 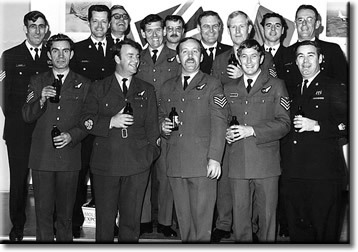 I think that the person on the left of the front row is George Menzies who was on Movements at Brize Norton in 1965 / 1966 ?. He then became a Load Master on Hercules. Just another point, the tune played on the video of the RNZAF (Queen, Don’t Stop Me Now) was played at the funeral of our old friend Gordon Woods. You've hit me again. 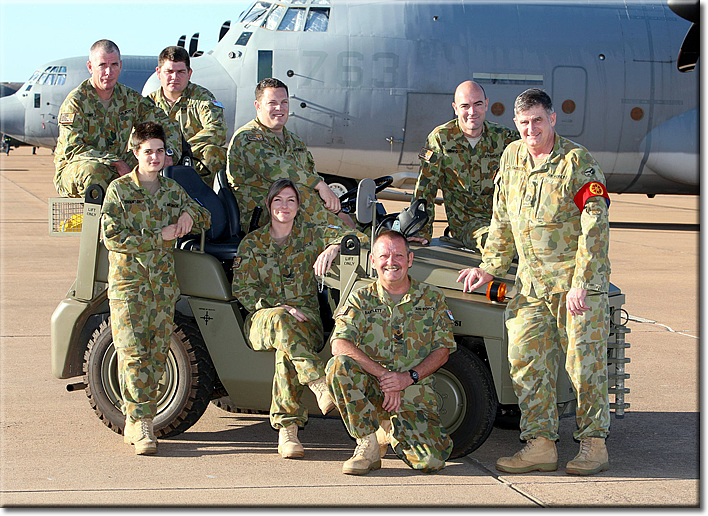 Re the RAAF mystery photo in 011609: The photo was taken last year at Air Movements RAAF Base Tindal (near the town of Katherine in the Northern Territory). From memory, it was Ex Pitch Black. 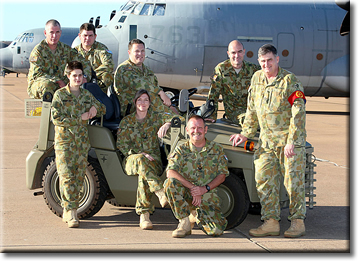 The people in the picture included myself as A/OIC, CPL Rob Phelan (currently deployed), LAC Wozza Morris (currently deployed), CPL Kirstine Horne (about to go home from deployment), FSGT Mick Bartlett (Reserve Air Load Team), ACW 'Itch" Yovanitch (on relief manning) and LAC "Fro" Coupe also on relief manning. You are correct Vic! You can claim your prize at the customer service desk of any Woolworth's Limited department store. I can give a few more details on the beast. Made by Shelvoke and Drewery, there were 2 versions used in the RAF; one with a very high mast which was a problem and the other was the shortened version used by Movers. It could lift between 12,000 and 18,000 lbs at 24 inches from the rear of the tynes (that's what it said on the plate), however the top limit was only reached if a few guys were sat on the engine (perhaps as shown in the photo in OBB #122408). At JATNE in Nicosia we had both but you had to be careful loading Beverleys as there was not much clearance with the high mast and when ours was u/s we used to borrow the ones from 103 and 113 MU. Sorry I couldn't get this to you earlier as I was one of the millions hit by the windows worm and just got my computer back from being de-bugged. the worm was known as Conflicker, Downadup or Kido and you might have to use the Microsoft MS08-067 patch. I have now moved to Firefox rather than IE and appear to have resolved the problem. Thanks for that Chas - Apparently Wayne Abbott of Sheffield operates a 1957 S&D Freighlifter and says there are a further five Freightlifter trucks in the Sheffield area. I believe there are also two trucks still in service in Belgium. Nice brief as usual. I like the way you can always add a photo relating to our briefs if we don't have one. We don't have a guest at February's meeting as it is our AGM but should there be anything worth reporting I'll let you know. 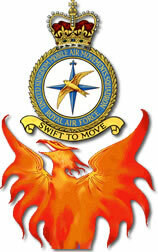 We now have our own website for the Cosford Branch of NSRAFA (National Service (RAF) Association). It's not very big yet and I thought that if you are in agreement I can get them to add the 'Elephant' off your site to it if you let me know one way or another. If you go into the NSRAFA site and click onto the Links you'll be able to log on to the Cosford website. I thank you for the great readings. I am glad now that Canada did not decide to buy Airbus derived AC (A400M), we would be using our old Herc for a while as well. I have worked with all the Canadians in the mystery picture #011609. 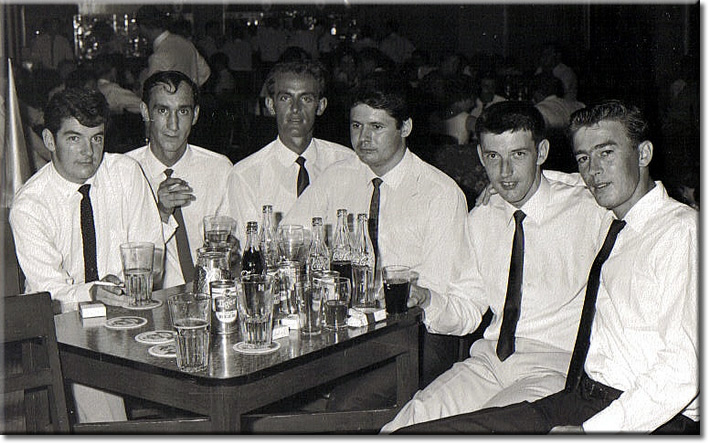 There is only one that a can't recall the name (first on left), the others are Paul Dechesnes, Red Fielding, Harry Friezen, Bryan Sharon & Bob Terrien. Thanks again and till we read again. I'm afraid the medal you showed representing the Silver Jubilee is in fact the Coronation Medal - the correct one is shown here and I was one of the privileged 9,000 to receive one in 1977. In response to Mal Porters' quest for news on Terry Titterington I can confirm terry is alive and well and now in retirement in Wootton Bassett. I can pass on his address if Mal cares to contact me. Small world too as the first time I met Terry Titterington was in Singapore too when I replaced him at the Payar Lebar Airport Detachment. The motley gang in front of the Bae 146STA - well the Officer on the left is Simon Hawkins, a nice guy but I would term a Wiblin of the 90's... The others I suspect were from 4624 Sqn RAuxAF. The Joint RAF-CAF mystery photo... I suspect it was taken at a Crosscheck possibly in the 70's looking at the their ranks. The ALM front centre is Roy Lewis who was famous for having to address the Imprest Office as to how he had ordered and consumed 7 Cheesecakes for a crew of 5. To the right of him is Pete Scott another ALM but a genuinely nice guy. I was on Pete's swansong trip in April '96 when he picked us up from Charleston. Half of the emergency water flasks were full of Harvey Wallbangers! To cap it all off, according to my logbook, we couldn't land at Lyneham due to fog and spent the night at Manchester..
Not sure about the Kiwi Andover - were they trying to create a belly hold? Heck Ian - you were the only one to spot the "deliberate error" regarding the Jubilee medals - Well done! Thanks for all the other snippets! 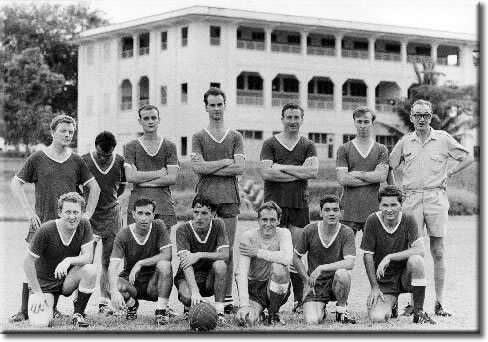 Ref the Changi Air Movements Football Team, the missing Flight Sergeant is Lou Watson who was on FEAF MAMS. I also played but must have been away working hard! Thanks Ian - Mal will be happy to learn that. While I was in my local Borders bookstore today I was flipping through the latest issue of "Flypast" magazine (probably a couple of months behind the UK I would guess) and I was quite dismayed to see a set of pictures in it of Belfast G-BEPS, formerly XR368 "Theseus" , being broken up for scrap in October of last year. This is a picture of it taken at Southend airport, its final resting place, looking very sad prior to the scrapman getting his hands on it. I guess this just leaves the one in the RAF Museum at Cosford now, and hopefully that single example is guaranteed to be safe from the scrapyard. Talk about one-of-a-kind! Thanks Andy - but all is not lost - there is one operational Belfast still flying for HeavyLift Cargo Airlines of Australia. "Hector" - XR365, originally was sold as G-HLFT then as 9L-LDQ operating with HeavyLift Cargo Airlines, now carries the serial number RP-C8020. I was surfing the web last week and discovered that the Belfast aircraft that sits at Cairns Airport is the last one in service. 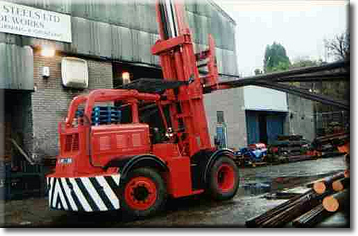 It is operated by Heavylift. There is one other at the Cosford Museum but not in service (XR 371 Enceladus). I have recorded more flights in 371 than any other Belfast, including a 3 Reds diversion to Brize. If the web is to be believed all the others are now broken down for scrap. I traced the Heavylift Belfast, registered as RP-C8020, back to the RAF where it was XR365 (Hector). My old log book tells me I did several tasks in this as well, including a trip to Norway to recover a crashed Harrier. Routine task except that we could not get back into Wittering because of fog. We diverted to Brize. 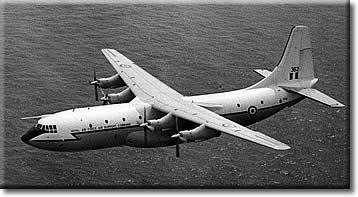 The next day, 2 Dec 1971, we returned to Brize to try again. No luck. 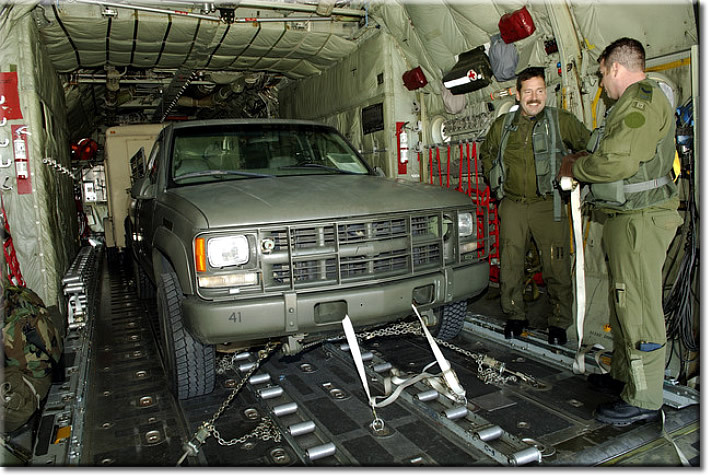 We had another task in Scotland that evening so we waited at Brize and the Herc from Lyneham diverted to collect us. That was the time we spent more time away from base than at base. They normally park another aircraft in front of the Belfast at Cairns so I am still waiting for the opportunity to take a decent picture. In the interim I am attaching a shot of XR 362 (Samson). I flew to Kenya in her once in 1972, to deliver a team that was surveying Lake Rudolph. Was all this really over 35 years ago? It's hard to believe that it was that long ago John. As a matter of interest I watched a documentary a few days ago about two whale sharks (Yushan & Taroko) that were delivered from Taiwan to Atlanta Georgia in 2007. The initial airlift taking them to Taipei was in the Heavylift Belfast. They then were transferred to a modified B747 freighter for the trip to Atlanta via Anchorage. Search as I may, I cannot find a photograph of the load on the Belfast. 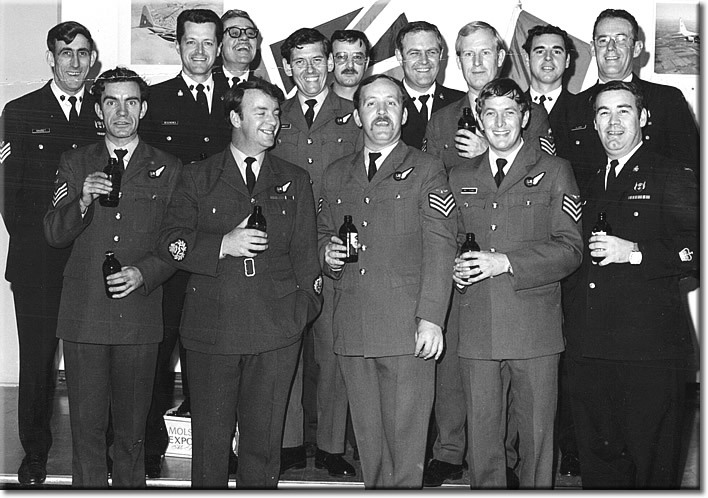 The only one I can name is front left and it is George Menzies, a Flight Sergeant ALM then although an old Mover. I thought his face was familiar... unforgettable! Hi Tony, and Happy New Year! 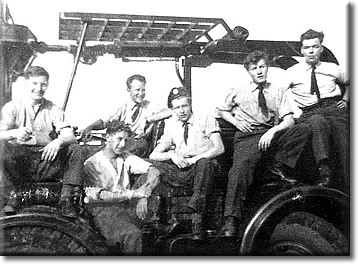 The chap in the foreground, in the load control pic, is Derek "Pucker" Perkins from Worcester. 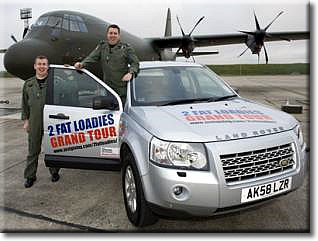 RAF Lyneham crewmen Flight Sergeants Spud Simpson and Daz Addison Flight have completed their "Two Fat Loadies Grand Tour" in aid of the RAF Association. They took part in a week-long driving trip from Lands End to John O’ Groats via every current mainland UK RAF Station and they raised valuable funds for RAFA in the process. More than £1,700 was raised through a guess the mileage competition among their colleagues and friends and during the tour Spud and Daz visited 42 RAF Stations, crossing 56 counties and three countries with an average daily mileage of 386 miles. the stations on their trip. FS Simpson said: “We would like to thank all the stations for their support especially RAF Valley who sent their RAF Association Liaison Officer to meet us. Thanks must also go to Marshall Aerospace for the loan of the Landrover and the graphics. The RAF Association provides welfare, help and support for any members of the RAF past and present and their families. It is also the largest single-service membership organisation in the United Kingdom, with around 74,000 members and almost 500 branches. The Two Fat Loadies are planning a further expedition for 2009. Tonight I was watching UKTV History Channel showing the events that culminated in the massacre of a lowland tribe by the sword of the Campbell’s. The Glencoe affair was very much mixed up with Jacobites and King James and the followers of William and Mary. 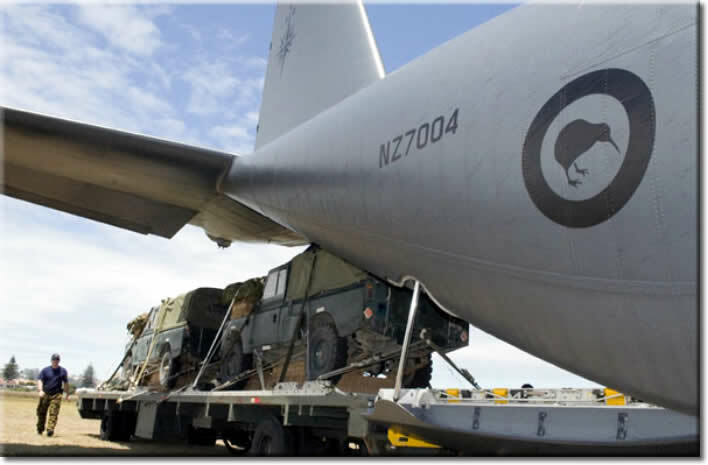 With this in mind – or was it – when I arrived back from Aden to RAF Marham in 1967 I had the post of Supply 2a which included local contracts and domestic supply. Not exactly the job I would have chosen but Marham was interesting and opportunities were open to explore. So along with gliding which I did at weekends and searching for a girlfriend; I was rather sad to be leaving when I got my posting to the Air Movements Course at RAF Abingdon – but little did I appreciate the opportunities that that would give at the time. 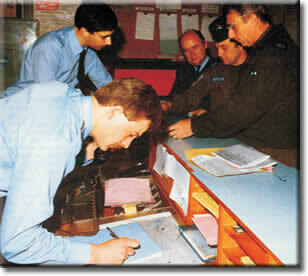 My replacement at Marham was Fg Off Bruce McLauchlan from the unit staff at RAF Bracknell. A most unusual man that I had ever met; let alone in the officer fraternity! The first thing he did on our hand-over was to study the telephone book and write down names of Campbell’s on his hit list. When I asked him what he was doing he said you remember the massacre at Glencoe? I responded that I knew about it but it was a long time ago. He said that the Campbell’s had not yet paid the price for that heinous deed and he was going to make sure that no Campbell receive any service from the Barrack store! That alone was not the end; the local contract for dustbin clearance at Marham was quite lucrative and for many years Jack Howes, a local man, had the contract and performed it to satisfaction. At the time of my posting this contract was coming up for re-tender. A larger consortium Perle Waste was competing for the contract and I briefed Bruce on how to handle it so that success for the station would be established. Little did I realise what would happen when I left! Bruce received the Perle Waste contract which was submitted so Bruce telephoned Jack Howes and told him the price offered - Howes submitted his price and regained the contract (a criminal offence). What with the Campbell situation along with the contract dealings it wasn’t long before the senior management at Marham realised that they had a serious situation on their hands with Bruce McLauchlan and he was administratively discharged. The next time Bruce was seen on the station he was driving Jack Howes' dustbin cart collecting dustbins! He did this for some time and then the station Commander got wind of it and left an order that Bruce was never to be admitted on his station again! Thanks Charles - it's scary to think that people like that are walking among us! I am continuing to unearth more blasts from the past! Only problem is that I am somewhat short on names - anyone out there who can help? Back Row: ? Mal Porter ? Centre Row: ? John McNally Gordon Drake ? Sometime in 1970 or 71. This is my most favourite kite in the world; it's the actual one that brought me back to the UK from that stinking hole Aden in January 1957. A NEW long-range aircraft to replace the Handley Page Hastings in RAF Transport Command was a subject deliberated extensively by the Air Council in the early 1950s. The call for such a type hinged on the need to move an Army division from the UK to the Far East within a four-week timescale. Operational Requirement 315 was drawn up and was aimed principally at the promising four-jet Vickers V1000 project based on the Valiant V-bomber. In 1954, the Planning Staff proposed a force of 24 V1000s and 32 Beverleys, but Government financial restraints cut these figures to 12 and 24 respectively. However, because the Vickers transport would not be available before 1959, the Air Council recommended that the gap be filled by de Havilland Comet 2s. By mid-1955, the Council had provisionally agreed to order six V1000s, but figures emerging from Vickers were not encouraging. They showed that the aircraft weight was increasing, but with no added power from the Conway engines the aircraft was falling behind the Operational Requirement with payload/range being seriously compromised; delivery had also slipped to 1960.Then, in November ’55 the economy axe fell and the V1000 and its civilian VC7 counterpart were cancelled. From a fall-back position, the Comet emerged as the logical compromise and while considered unsuitable for some aspects of OR315, it would give the RAF valuable experience in flying jet-powered transports. 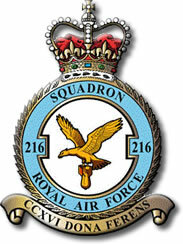 No 216 Sqn at RAF Lyneham became the proud operator of the Comet 2 and the first operational mission with the type took place on June 23, 1956, when a UK Government delegation was flown to Moscow for the Soviet Air Display at Vnukovo. Thus began 19 years of successful RAF Comet operations taking in the Mk 2s and the later, longer-range Mk 4s. For Operation Musketeer, the Anglo-French operation to recover the Suez Canal, the newly-acquired Comets provided VIP transport, shuttling military staff between the UK, Cyprus and Malta. In September, aircraft started a regular service to Christmas Island in connection with the Operation Grapple nuclear tests, the round trip taking 45hr flying in less than four days via Iceland, Labrador, the USA and Honolulu. In February 1958, three Comets provided support for a four-day reinforcement exercise to Libya, Operation Quickstep. Casualty evacuation flights and a lifting of the ban on Service families flying on Comets finally dispelled any concern about the type’s safety. Cruising at 480mph, the shapely 44-seaters became heavily used as they went about their business linking Britain with its overseas bases. The Comet 2s went on to serve until withdrawn in April 1967, supplemented from January 1962 by five Comet 4Cs, also operated by 216 Sqn. A controversial ban on wearing RAF uniform off duty is lifted. Top brass at RAF Wittering, Cambs, stopped personnel wearing their uniforms away from base last year after claims personnel were abused in nearby Peterborough. Subject: Close Call for Canadian Convoy! The community might be interested in this one, a close call for our Canadian colleagues. What a buried mine or IED looks like close up!. 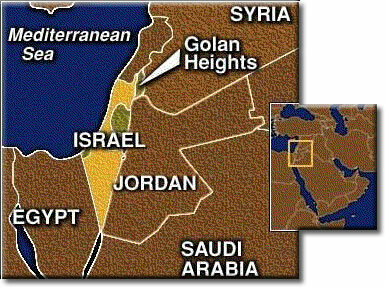 In 1984 I was the Mov Con Mcpl in Golan Heights Israel, and one of my duties was to go either to Damascus Syria or Tel Aviv to meet the regular flight. On the day in question the aircraft was coming to Damascus, so my Cpl and I went to meet the flight and while offloading I was on top of the pallet making sure the side of the load would not hit the airframe. All of a sudden the Syrian driver backed-off quite quickly, I lost my balance and my left leg got twisted between two boxes. So my Cpl and other people helped me down and sat me in the truck. Finally the aircaft was offloaded and we headed back to Camp Ziouani. When we arrived at the Israeli border my Cpl took my area pass and went to see the IDF to let us go through, but one of the guards came to the truck and told me to get down. I told him that I was hurt but he insisted that I get down from the truck. So, suffering from great pain, I came down and he told me OK get back on. I got mad and told him that he was a *ucking *sshole! He turned back and asked me what I said. I told him the same thing, so he asked me what it meant. I told him that it meant .. friend, pal, buddy, and so he shook my hand and we drove off. The next day I was called in by the Camp Commander. I limped into his office with my cane, still suffering with great pain. He said to me have a seat you *ucking *sshole! Well I was quite surprised because the Commander was a very friendly person and to call me that took me off guard. I asked him what was going on and he told me that he crossed the Israeli border not too long after us, and the Israeli guard keep shaking his hand and calling him a *ucking *sshole, and so the Commander asked him where he got this expression. The guard told him that earlier two soldiers came along and they were both wearing the red band (Movements Wheel) and it was not hard for him to find me since he already talked to my Cpl. At first I felt pretty bad but the Commander started laughing and told me that it was a good one but to be careful, because some of the guards understood English quite well! That's a brilliant story - thanks Jacques! To celebrate our Golden Anniversary, Pat and I are going to take a Far East cruise. We fly from Brisbane to Singapore (Changi!) on the 30th January and overnight at Allson Hotel just a short hop from the Raffles Hotel. The next day we board the Legend of the Seas cruise liner to begin a 14 day cruise. The itinerary includes 2 days at Bangkok in Thailand, Sihanoukville Cambodia, Ho Chi Min City, Nha Trang, Hue/Danang in Vietnam, Sanya China, 2 days in Hong Kong, Xiamen China and terminate in Shanghai. We have a couple of days in Shanghai before flying back home via Melbourne. All up about 19 days. I know you will miss us while we're away! Perhaps a visit to my website will help... I have added a music videos page as well as a 'blog' on our Asian experience. Of course that is a 'work in progress' ! Click on the hyperlink below and enjoy a few minutes of musical interlude and follow the progress of our trip. Leave a message in my Guestbook so I know you have visited... or else!! I'm sure all our readers will join me in congratulating you and Pat... have a safe and enjoyable cruise!